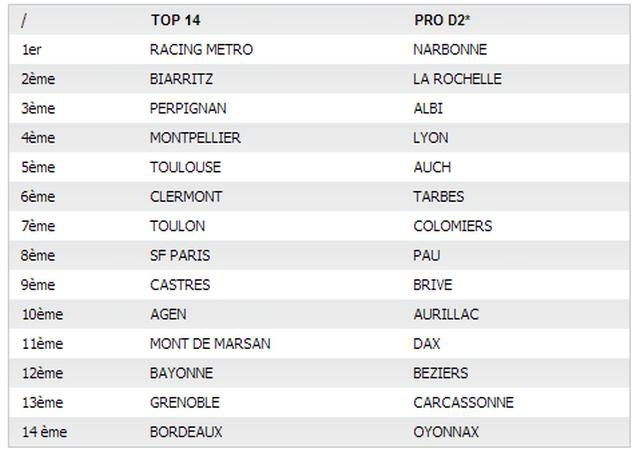 The LNR (French Rugby National Ligue) has met on Monday and Tuesday in order to take some actions concerning the Top14 and the ProD2. Called “New Deal”, this action plan has got some strong axis in order to change some things. This deal has for purpose to make the professional French rugby grow, and so the French national team. This plan aims the economical politic of professional clubs, but also on some sports rules that will apply next season. Enhance the continuity of the game and the offensive game. 1) To enhance the attractivity of the Top 14 and the ProD2, and enhances the show, the LNR has decided to modify the defensive bonus point. To have it, the losing team must lose by 5 points or less, against 7 for now. 2) In order to reduce the number of fouls and bad plays by the players, every player having 3 Yellow Cards on the season will be banned for 1 game. 3) The 1 minute preparation for the kicker will be strictly controlled, and the time displayed on the screens of the stadium. 4) If the Salary Cap stays fixed at 10 M€, it now includes a rule to help teams giving players to the French national team. Between June and August, the French staff will list 30 players being part of the French group. The clubs employing these players will add 100 000€ by player (Example, for 3 national French players, the Salary Cap will be 10.3 M€). This measure will be applied next season on the 30 players called up for the tour in Australia this summer. On the same page, every time a player will be called on the French team, the payment to the club will grow from 550€ to 1300€ per day per player. 5) rules will be softened when loaning a player to another club, like we often see in Football. This aims to let young players play more. 6) This year more than ever, the LNR had to face repeated attacks from some figures of French rugby regarding the refereeing, the LNR-FFR convention, the European Cup or the old age of its directors. To defend themselves against these “agitators”, the board of directors has decided to reinforce the sanctions against “the behaviours who would attempt against the image of the championship and the spirit of rugby”. Without saying what would the sanction be, they would be essentially economical and would have the nature of “impact strongly the budgets”. There is also a 10M€ pot to reward the formation of young players. The league has evaluated the formation clubs, based on sport and scolar results in the 2012/2013 season. Here is the list. As a comparaison this season, the budget allowed was 1.5 M€, and was given in order of the results of the Pro Championship.